New iPhone game is first NOAA app and only the second NASA game app. Just as with the real GOES-R, the challenge with Satellite Insight is to keep up with the massive influx of weather and other environmental data. NASA has a job opening. Wanted: People of all ages to sort, stack, and catalogue terabytes of simulated data from a satellite that launches in 2015. Agile thumbs required. Sorting terabytes of data? It’s more fun than it sounds. In fact it’s a game: Satellite Insight. The Space Place Team at the Jet Propulsion Laboratory created the entertaining app for iPhones to get the word out about GOES-R, an advanced Earth science satellite built by NOAA and NASA. Described by the Los Angeles Times as possibly “the nerdiest game ever,” Satellite Insight may be downloaded for free from Apple’s app store. Be careful, though, once you start playing it’s hard to stop. Some reviewers have likened it to Tetris, one of the most popular video games of all time. GOES, short for “Geostationary Operational Environmental Satellite,” is the workhorse spacecraft for weather forecasters. NOAA operates two (at a time) in geosynchronous orbit, one above the west coast of N. America and one above the east coast. They monitor clouds, wind, rain, hurricanes, tornadoes and even solar flares. The GOES program has been in action since 1975. GOES-R is the next-generation satellite with advanced technologies far beyond those of the older GOES satellites. It has sensors for lightning detection, wildfire mapping, storm tracking, search and rescue, solar imaging, and more. Many of the sensors are trailblazers. For example, the Advanced Baseline Imager has 60 times the capability of the current imager–16 channels instead of 5. It has twice the spatial resolution and five times the temporal refresh rate, including the 30-second imaging of weather systems over a region of 1000 km x 1000 km. Also, the Geostationary Lightning Mapper can count and pinpoint lightning bolts over the Americas 24/7. It’s the first such detector to fly on a geosynchronous satellite, and it could lead to transformative advances in severe storm warning capability. All in all, GOES-R represents a “huge technological leap from the current GOES.” We know this because Satellite Insight tells us so. The app has an informative “Learn More” feature where players can find out about the satellite and the data they have been sorting. Which brings us back to sorting data. It’s a bit like eating Cheerios; just don’t tell the kids it’s nutritious, and they love it. Helping GOES-R gather and stash data from all those advanced sensors is just as satisfying, too–a dose of Earth science wrapped in thumb-flying fun. More information about Satellite Insight may be found on the web at http://itunes.apple.com/us/app/satellite-insight/id463588902?mt=8. 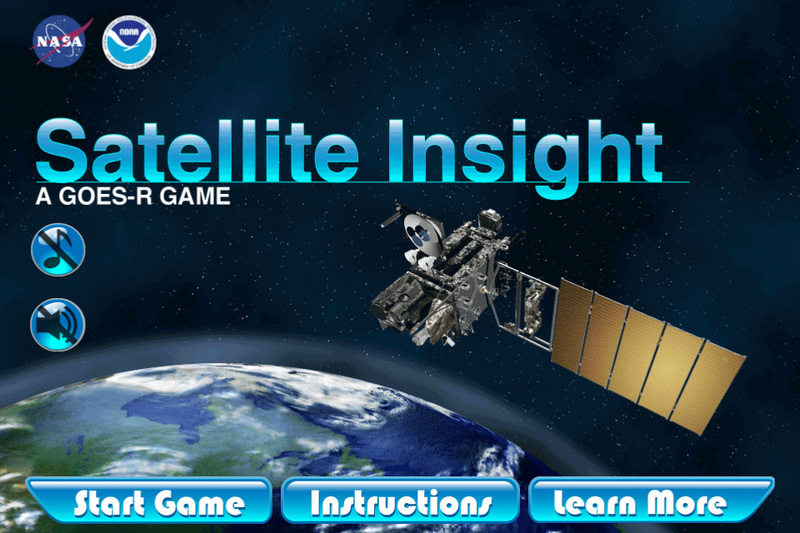 The game also available in web form (flying thumbs optional) at http://spaceplace.nasa.gov/satellite-insight.